A quintessentially Scottish image, the shortbread tin immediacy of Landseer’s The Monarch of the Glen conceals its complex and multi-layered identity. As a campaign is mounted to keep the painting in Scotland, Richard Woodard delves into its chequered past. Some images are seen so frequently that you pass over them too easily, never stopping to examine them in detail. So it is with Sir Edwin Landseer’s The Monarch of the Glen, which in its time has graced living room walls up and down the land, and been commandeered to sell everything from Scotch whisky to soap, mineral water, shortbread and soup. Now, as the National Galleries of Scotland (NGS) races to raise £4m in four months in order to keep the work in the country – and place it in public ownership for the first time – Landseer’s oil painting is coming under fresh scrutiny. First used by Dewar’s 100 years ago, the proud, solitary stag has also been associated with Glenfiddich, Walkers Shortbread and Baxters Soup – recognition that this strong image stands as a visual shorthand for Scotland; another Saltire, or thistle, or bagpiper. In fact, as Scottish National Portrait Gallery director Christopher Baker acknowledges, it’s a painting that has ‘become many things’, weaving stories around itself that are ‘complicated and layered’. But we’ll get to that soon enough. For now, take a moment and just look at it. A lone stag stands, strong and upright, in front of a rugged Highland landscape. The clouds behind look threatening, but the animal is bathed in sunlight and exhibits the grace and power of a creature in its prime, from the majestic upward surge of the antlers to the alertness of eyes, nose and ears and the well-fed, powerfully built torso. The sense is of an artist in awe of his subject, but also empathetic. Landseer’s love of animals was not the sentimentality more prevalent in modern times, but an acknowledgement of what was seen at the time as their inherent nobility – a quality also apparent in the four monumental bronze lions he sculpted for Trafalgar Square in London. Strange as it may seem, the painting was at first unwanted. Commissioned in 1849/50 as the first of a planned three-part series to adorn the refreshment rooms of the newly built House of Lords (fire had devastated the Palace of Westminster in 1834), it was rejected on its completion in 1851. The reasons are not entirely clear – there was a debate about the cost, and a sense that the subject matter might have been thought ‘inappropriate’ (possibly because of a preference for scenes of human history), but Landseer’s commission was just one among many linked to the fitting-out of the new Houses of Parliament. ‘Some succeeded, some didn’t,’ Baker says. The Monarch of the Glen passed into private hands, but its public profile grew, both through a warmly received exhibition at the Royal Academy and through its widespread reproduction via steel engravings. Soon an artwork intended to be contemplated over lunch by the highest in the land was on the walls of households throughout the country. ‘Landseer recognised early on that his work would have greater power if he allowed it to be reproduced,’ says Baker. ‘He had considerable business acumen. He was a worldly figure and he knew how to play the market.’ This strong commercial connection with The Monarch has continued ever since. The Monarch’s new life as a marketing image began in 1916, when the painting was bought by Sir Thomas Dewar, a born salesman who did so much to make John Dewar & Sons’ whiskies globally successful. 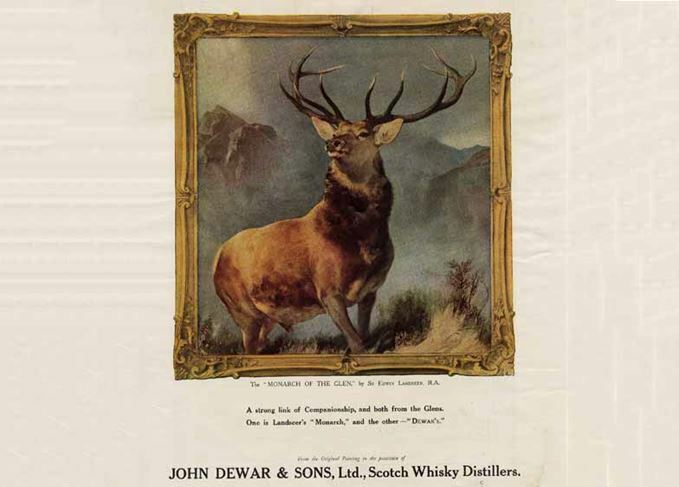 A big advocate of using art as advertising, Dewar was also associated with marketing for Pears, meaning that Landseer’s proud stag soon acquired the unlikely dual role of helping to sell blended Scotch and soap. Its commercial potential has been endlessly exploited ever since, by companies as diverse as Nestlé and Baxters, but also – most famously in the realm of Scotch – by Glenfiddich, which began using it in 1968 and maintains a heavily stylised version of the image as its logo today. The painting, however, remained with Dewar’s, and passed into Diageo’s hands when it acquired the business in 1986. When, in turn, Diageo sold Dewar’s to Bacardi in 1998, the work wasn’t included as part of the deal. The commercial appropriation of an original artwork can be viewed as a compliment to Landseer’s success in creating an image of enduring symbolism for a certain idea of Scottishness – but that symbolism has proven controversial over the years. For some, the romanticisation of the Highlands – the encapsulation of what some call the ‘Balmorality’ – is no more than a visual epitome of the English colonisation of Scotland; a Scotland where the deer are fattened for the chase, and for the pleasure of the southern aristocracy. ‘It’s become many things,’ acknowledges Baker. ‘It’s become a great icon for Scotland and very definitely for the natural wonders and beauty of the Highlands. If The Monarch has inspired marketeers, it has also piqued the interest of artists in more modern times. Sir Peter Blake – English pop artist and best-known for his work on the Beatles’ Sgt Pepper album cover – created After The Monarch of the Glen in 1966, a relatively faithful recreation of Landseer’s original. That in turn spawned two further ‘reinterpretations’ by Peter Saville – After After Monarch of the Glen and After After After Monarch of the Glen (in association with Dovecot Studios in Edinburgh) – which offer increasingly distorted versions of the image, while retaining unmistakable echoes of the original. Over the past 165 years, The Monarch of the Glen has been loved, derided, exploited, reassessed and bastardised. Once, a radical Scottish magazine pasted the head of Margaret Thatcher onto the image. But Baker has no problem with that. That’s a process which will continue if and when NGS takes possession of the work, with Baker emphasising that he wants there to be a continued interaction with this major piece of Scottish iconography. If NGS can raise £4m within the four-month deadline – and Baker says he is ‘confident’ that it can – then The Monarch of the Glen, a publicly commissioned work kept in private hands and used for commercial gain for the past century, will pass into public ownership for the first time. If you wish to support the fundraising campaign to keep The Monarch of the Glen in Scotland, you can do so via the NGS website. Johnnie Walker owner donates £4m to help National Galleries of Scotland acquire the painting. Clichés are rooted in truth, says Dave Broom, so don’t ignore them – but look beyond them. Stock issues? Modern marketing techniques? Whatever the reasons for NAS, Neil Wilson isn’t happy. Dewar’s is ‘reinforcing its commitment to age statements’ with the launch of a 25-year-old blend. The globe-trotting extrovert and born salesman was one of Scotch’s most colourful characters.